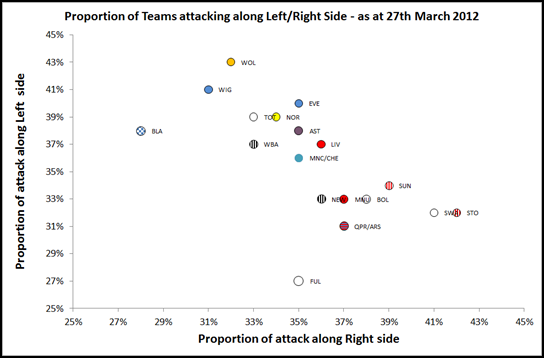 In a recent piece on Zonal Marking they looked at which sides teams tend to attack on. The piece was interesting but I felt charting the % attacked down the left/right/middle for each of the 20 teams resulted in something that was too busy and difficult to interpret. Using the data from whoscored.com I've created my own version which just plots % attacked along the left and right hand sides. As the total for left/right/middle equals 100% you can infer the proportion attacked down the middle by the relative left/right values. ﻿If you consider Man City / Chelsea's value to be the centre and then compare how different each team is to the average. For most teams there is a strong inverse correlation between attacking down either flank i.e., if they attack more down the right they attack less down the left as the proportion of attacking down the middle doesn't vary as much as the left/right values. Although Swansea and Stoke for example have similar preferences for attacking sides, this will manifest itself in different ways. For Swansea, the Rangel - Dyer combination along with Williams' diagonal balls from the left side of defence results in a large proportion of attacks along the right. Stoke are not just a set-piece team but it forms the biggest source of their goals: 45% of Stoke's goals have come from Set Pieces (which excludes Penalties) compared to the league average of 24%. If you follow the logic that you want to maximise set pieces then you want to put the ball long and relatively close to the touch line to maximise the chance of a corner/throw in or a foul from any challenge for the ball. Why so much down the right hand side? My theory would be that as the majority of footballers are right footed, having a set piece on your right hand side makes it easier for an attacker to kick the ball goalbound compared to a defender having to clear the ball. Also, for a defender to get there first, their body angle is likely to result in a clearance to touch (and another set piece) rather than a clearance down field. It might not please the purists but it's generally pretty effective as I had to witness as Stoke beat Swansea 2-0 at the Britannia with both of the goals coming from set pieces from attacks down the right hand side (from Stoke's point of view), one from a corner, one from a throw in.